Portable CO2 keg charging kit. 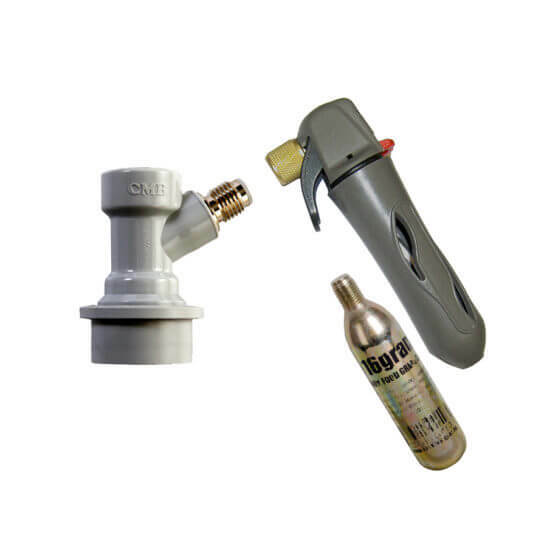 Quickly and easily pressurize a ball lock keg at home, on the beach, or anywhere else. Lightweight, hand-held charger accepts standard 3/8″ 16g CO2 cartridges and threads onto any ball lock gas disconnect with standard MFL threads (disconnect is included). 16g cartridge provides approximately enough CO2 to pour one 2.5 gallon keg. Additional cartridges are available here through All Safe.